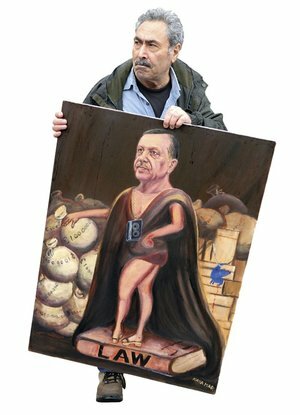 Artist Kaya Mar with his satirical portrait Erdoğan, the Turkish Sun King – after France’s absolute monarch Louis XVI. The last straw came this summer when well-known human rights activists, including Amnesty International (AI) Turkey Director Idil Eser and founding member Özlem Dalkıran, were taken into custody during a training workshop in Istanbul. They are still in pre-trial detention for allegedly aiding a non-specified terrorist organization. When AI Secretary-General Salil Shetty called world leaders to break their silence on the human rights meltdown, few democratic dissidents inside the country held out much hope. Advocates for a secular Turkey are still trying to digest being re-labelled as ‘the East’ following the Soviet decline. Turkey’s NATO membership no longer entitled it to membership in ‘the West’, with geo-political thinking assigning us the role as ‘moderate Muslims’ who could bridge East and West. Playing a leading role in the Middle Eastern world seemed to suit Recep Tayyip Erdoğan and his ruling Justice and Development Party (AKP). Erdoğan’s Western enthusiasts included German Chancellor Angela Merkel whose pre-election state visit to Turkey back in October 2015 drew accusations of meddling in the electoral campaign. Earlier in the year, there had been other elections. On 7 June 2015, a coalition of leftists, feminists, LBGTI+ and peace activists had supported the pro-Kurdish People's Democratic Party (HDP), and helped it overcome the electoral threshold to become the third largest party in the Turkish parliament. The victory of this democratic bloc was short-lived. The ruling AKP quickly manoeuvred for new elections to restore its majority. More than half the population was outraged. The four months between the two sets of elections were full of disasters. Bomb blasts ripped across the country, some claimed by ISIS or Kurdistan Freedom Hawks (TAK). A few weeks before the second elections, two bombs went off killing 103 people at an Ankara Peace Rally. But when, just days later, Merkel visited Erdoğan it was all broad smiles for the cameras – it felt like the two politicians were mocking a mourning country. It was in this climate of desperation that Erdoğan regained his majority. The attempted and suppressed coup of 15 June 2016 was bizarre. It was all over in a matter of hours. The coup and its aftermath, which left 264 dead, also left even the most experienced Turkish political analysts scratching their heads. Although much of the Western media sees the coup as an Erdoğan plot to consolidate power, there is mounting evidence that it was indeed plotted by Gulenist military officers. It seems likely Erdogan knew of the coup and was prepared to use it as an excuse for a general crackdown. Up until 2013 the Gulenists had been close allies of the AKP and held key positions in the Turkish state. During two show-trials, in 2007 and 2010, Gulenist judges helped Erdoğan rid himself of Kemalist military officers who saw themselves as guarantors of Turkey’s secular constitution. By 2013, more than 10 per cent of generals and admirals were behind bars. But the Gulenists were ambitious and wanted a bigger share of power. Erdoğan resisted, setting in train a kind of clandestine civil war. The Gulenist judiciary and police now launched corruption operations against Erdoğan and his business associates and in December 2013 the government responded by outlawing Gulenist networks. Turkey’s democratic bloc knew from the start that it was doomed if the Gulenist coup succeeded. But the state of emergency imposed after the coup was used as a pretext for closing all political space and silencing critical voices. Targets included HDP co-chairs and deputies, and publications such as the socialist Evrensel, pro-Kurdish Őzgűr Gűndem and even the mainstream, secularist Cumhuriyet. Veteran leftists, who had survived torture and prison sentences during previous coups in 1960, 1971 and 1980, today express an ironic yearning for the good old days of at least a semi-separation of powers. These days the ‘accused’ are sent to court for aiding organizations and ideas they have spent their lives fighting against. This absurd yet well-prepared targeting – reminiscent of 1930s Germany – wears down the capacity for coherent and critical thought. Though it is no longer possible to claim there is any meaningful rule of law in Turkey, the courts are working overtime. Dissidents from all political backgrounds fill the courtrooms. Many of the Gulenists claim remorse and ask forgiveness from the state. But other dissidents – democrat, feminist or pro-Kurdish – who have been scandalously imprisoned under false charges, stand by everything they have said or done and courageously accuse the judiciary of working against the rule of law. Despite all the pain endured in today’s Turkey, the integrity of such dissidents lifts the spirit of those still struggling for a just and democratic country.